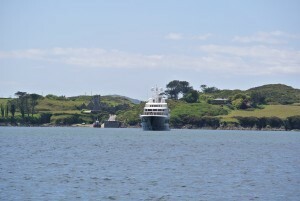 Air at anchor in West Cork, the luxury superyacht is reportedly on charter with George Clooney. Baltimore is a sheltered harbour on the Wild Atlantic Way in West Cork, and is gateway to Carberys 100 Isles. It forms the eastern boundary of Roaringwater Bay SAC (Special Area of Conservation). Baltimore Sea Safari operate coastal sightseeing and whale and dolphin watching boat trips from Baltimore. Luxury Superyacht Air visited the beautiful fishing village of Baltimore in West Cork for the second time in three years. 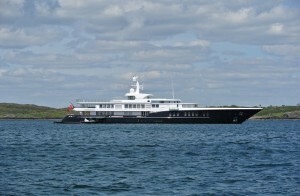 The vessel is on exclusive charter to the rich and famous at a cost of cost of $782,735 per week. George Clooney is reported to be the client aboard the boat. Air cost $700m to build in 2011, it is 81m in length has a beam of 11.6m, and has a total crew of 21. She can accomodate 12 passengers in 7 large staterooms. the observation lounge has a view over the 8m long pool. The sun deck has a gym, lounge area has a jacuzzi, and a 102″ pop-up TV screen for outdoor movie viewing. It has a certified helicopter pad. There is an elevator to all decks, massage, steam rooms and a large foldable swim platform with bar. She carries two 9.8m tenders. To guarantee your seat, pre-book you trip! We usually operate from the Ferry Pier in Baltimore. However, trips can also be arranged from other ports in West Cork on request.